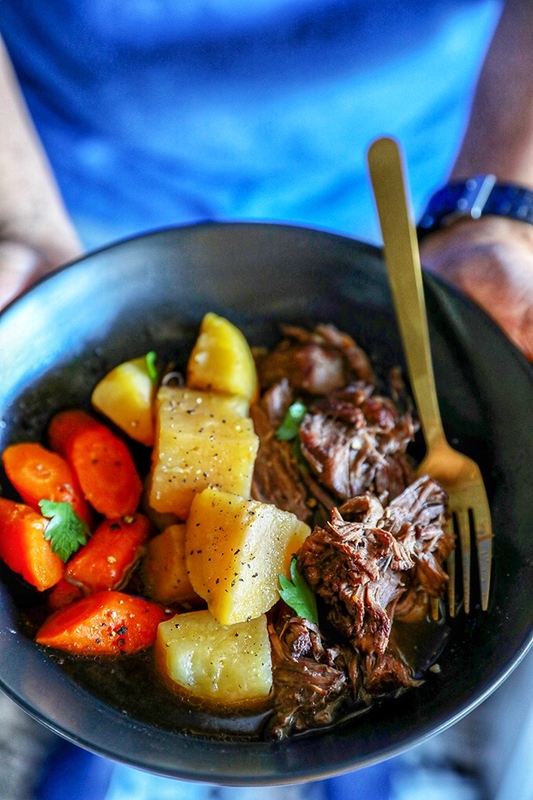 This Instant Pot Pot Roast recipe delivers slow cooked flavor in a fraction of the time. 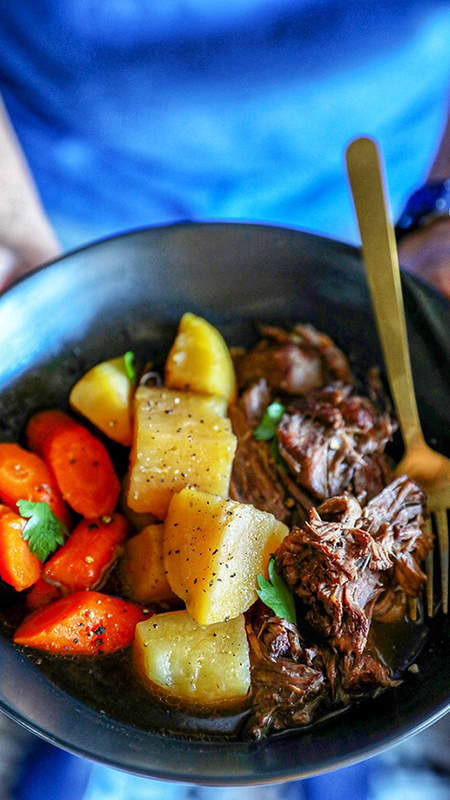 Tender chuck roast is paired with chunks of Yukon gold potatoes and carrots in a flavorful classic pot roast recipe. 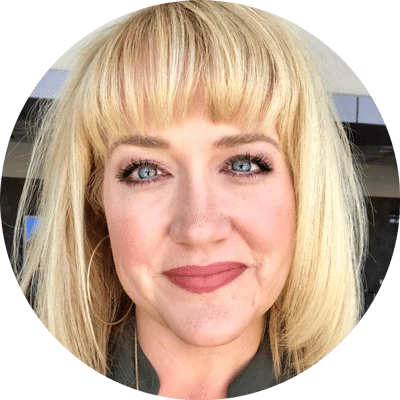 The Instant Pot is a must have kitchen appliance, and I’m always looking for good reliable Instant Pot recipes. 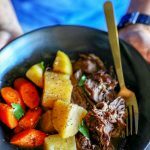 For this Instant Pot Pot Roast, I adapted a classic Pot Roast recipe for the Instant Pot. 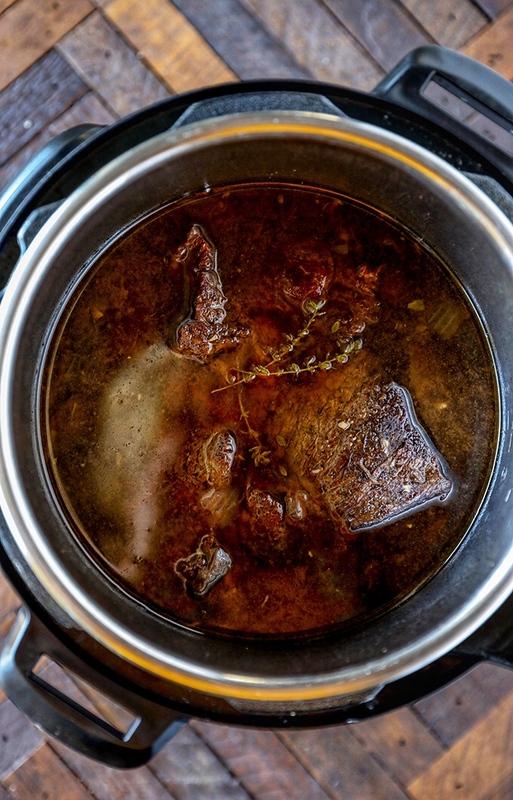 A good quality roast cooked with onions, garlic, fresh herbs and red wine to create a broth that is layered and flavorful. To add an extra depth of flavor, I included a tablespoon of soy sauce. 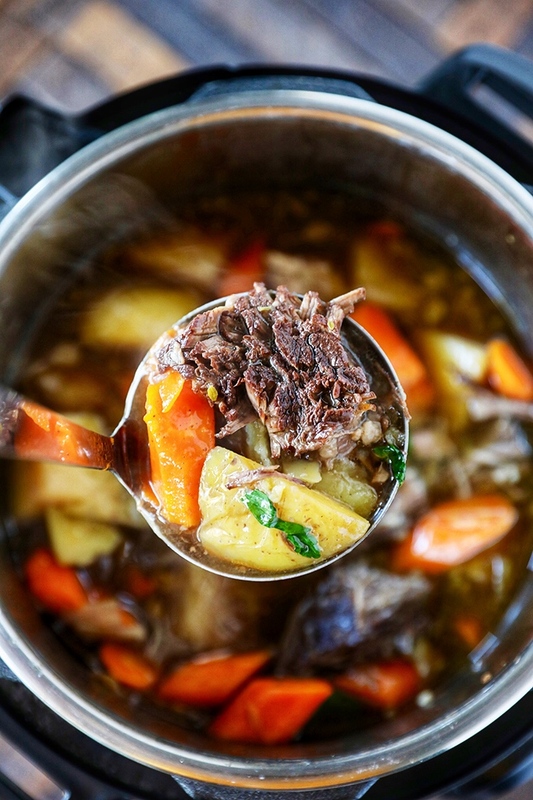 You won’t taste the soy sauce, it just gives the pot roast the extra umami flavor. Building flavor is important in every recipe, but it’s especially important when cooking quickly under pressure. Start by searing the chuck roast using the Sauté Function set to the highest setting. Instant Pot Tip: Hit the adjust button until the MORE lights up. That means it’s heating on the highest setting, perfect for searing. After searing, remove the chuck roast from the Instant Pot and sauté onions and garlic. Then return the roast to Instant Pot and add wine, beef broth, soy sauce, thyme, bay leaf and additional salt and pepper. Cook for 70 minutes on high, then do a quick pressure release and add carrots and potatoes. Cook for additional 15 minutes on High Pressure, then let Natural Pressure Release. Natural Pressure Release is important for a tender roast, so don’t skip that step. Use a large slotted spoon to remove vegetables and roast. 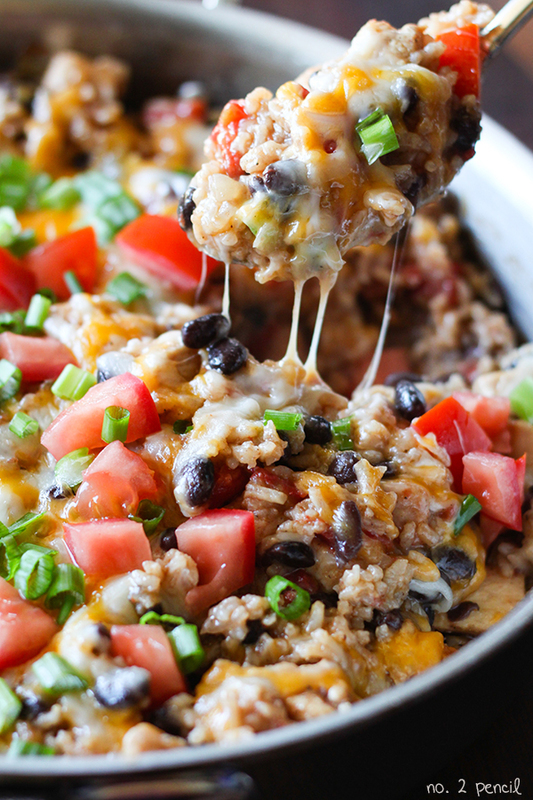 Strain leftover liquid to remove excess fat and serve over meat and vegetables. 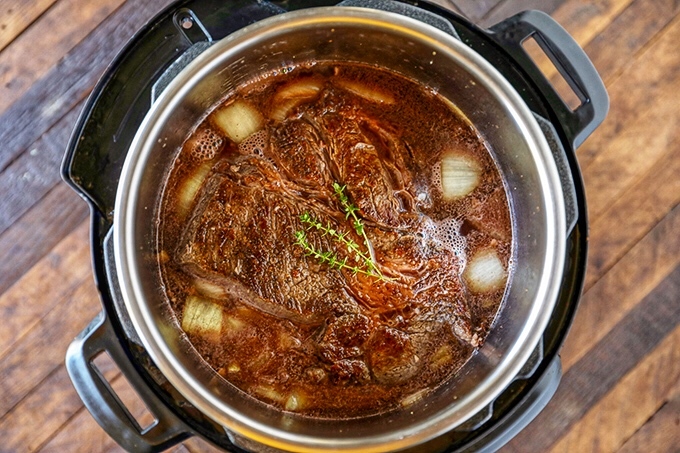 I prefer my pot roast to be fork tender, so I use a similar cooking time as my Instant Pot French Dip Recipe. For sliced pot roast, try reducing initial cooking time by 10-15 minutes. This recipe will take about 2 hours from start to finish, including searing time and Natural Pressure Release. Cut potatoes and carrots to specified sizes to prevent them from overcooking. In a 6 quart Instant Pot, add olive oil and select Sauté function and hit more to heat to highest heat for searing. Pat chuck roast dry, season with 2 teaspoons of kosher salt and 1 teaspoon of freshly ground pepper. Sear chuck roast, about 5 minutes per side. 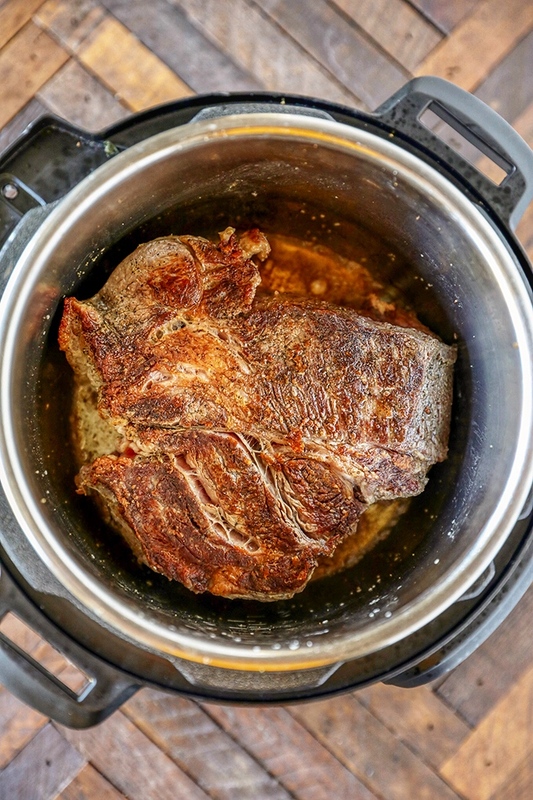 Remove chuck roast from Instant Pot and set aside. Add onions to Instant Pot and sauté for 1-2 minutes, then add garlic and sauté for an additional minute. 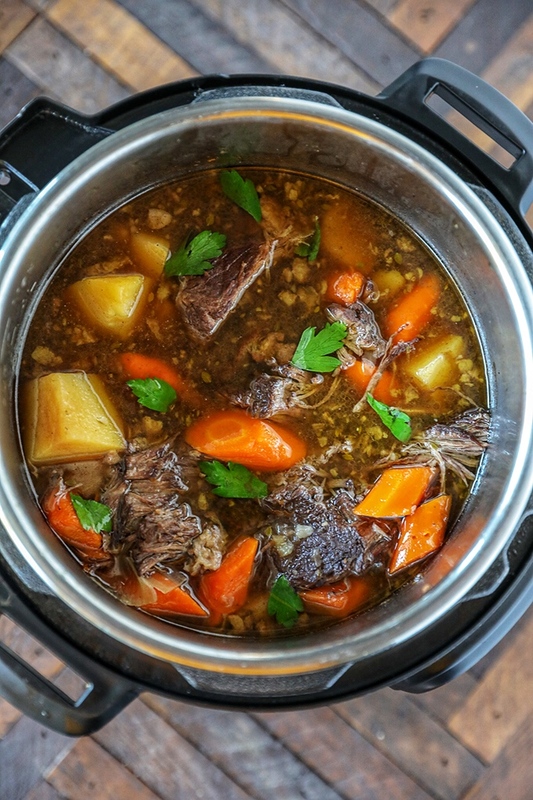 Return chuck roast to Instant Pot and add wine, beef broth, soy sauce, thyme, bay leaf, 1 teaspoon of kosher salt and 1/4 teaspoon of freshly ground pepper. Set Instant Pot to High via Manual Mode for 70 minutes. 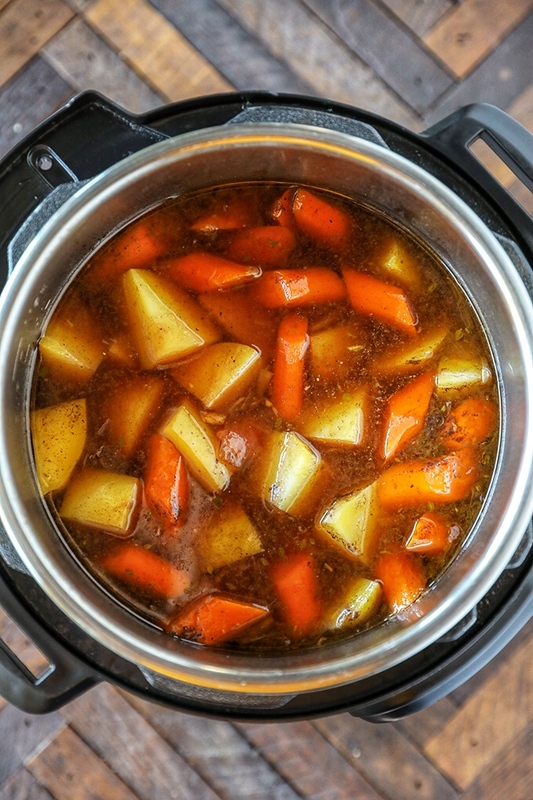 Once Instant Pot counts down from 70 minutes, use a quick pressure release, then add carrots and potatoes to pot. Set Instant Pot to High Pressure again via Manual Mode for 15 minutes, then let pressure release naturally. 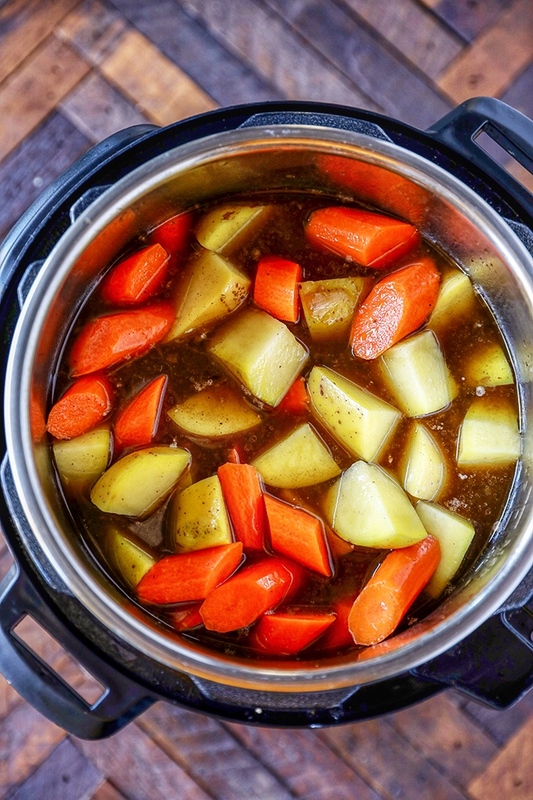 Once pin drops, open Instant Pot and use a slotted spoon to remove roast, potatoes and carrots. Discard bay leaf and thyme stems. Strain remaining liquid as serve over roast and vegetables. Season with additional salt and pepper as needed. Garnish with a sprinkle of fresh parsley.